Burger Bar is incredibly pretentious joint with a good view and all sorts of options, none of which are cheap; however, if you’re willing to deal with the pretentiousness and the cost, you’re going to get really really tasty fresh food, but not want to return for another six months because it’s more an experience in the end. Burger Bar, the brainchild of superstar chef Hubert Keller is located on the nth floor of Macy’s in Union Square. It’s a build-your-own-burger kinda place. Everything is fresh, and of good quality. Rather than blather on about it, I encourage you to peruse the menu yourself. Burger Bar is pretentious. It just is. I don’t need to say anything else. But pretentious is passable if your food measures up. –> Black Angus Beef, Pesto, Cheddar/Pepper jack, Peppered bacon, grilled onion Chipotle Aioli + skinny fries. On this occasion, I was with my friends Jesse, Gabe, and David. The latter two were in town for a Scrabble tournament, and Gabe had wanted to go here since it opened. So finally, we made it. As with my prior experiences, the burger was pretty much awesome. You really get what you pay for. And having just taken second at the tournament the day before, I was $750 richer, and didn’t mind paying! There is tons of flavor in every bite, and the go-to additions for me are so harmonious. You really savor every bite because you can taste just how fresh every ingredient is. The one downside to the burger is that it’s just not very big. I’m not sure I’ve ever felt quite full enough leaving here, which can be an issue, especially for the money one is shelling out. But this lunch called for a treat. Between the four of us, we decided to actually spend $15.25 on two milkshakes. I’d always wanted to, but c’mon, are you kidding me? So needless to say I was thrilled to be able to split one. David and I got the Caramel Latte milkshake. Yeppppp. That’s all you get for $8.75. Actually, you probably wouldn’t want too much more with all that butterscotch. 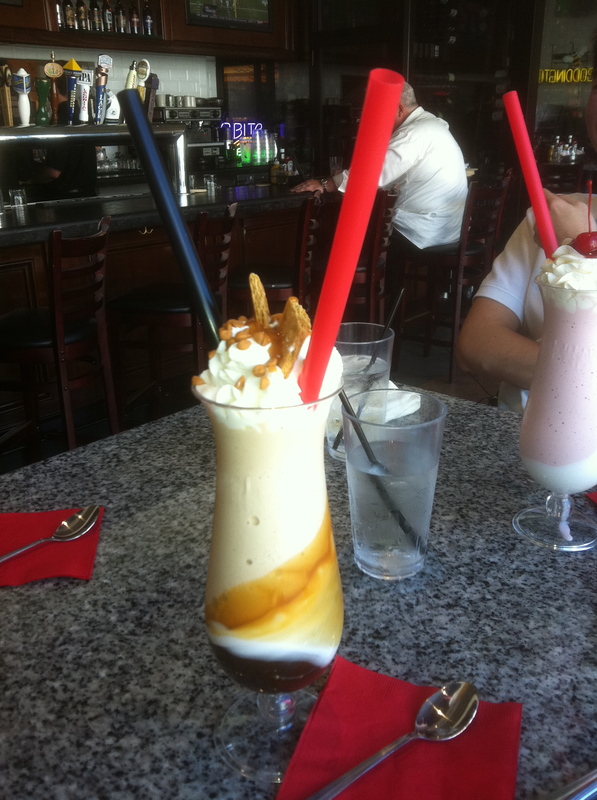 Quite frankly, the milkshake is a more polar version of the burger. It’s proportionally MORE expensive, and even better than the burger. Seriously, the milkshake we got was fantastic. Granted, I am a sucker for caramel, so take what I say with a grain of salt[ed caramel]. But if you are feeling spendy, you do not want to miss the milkshakes. As a side note, Jesse and Gabe split the strawberry milkshake, at a bargain price of $7.00. 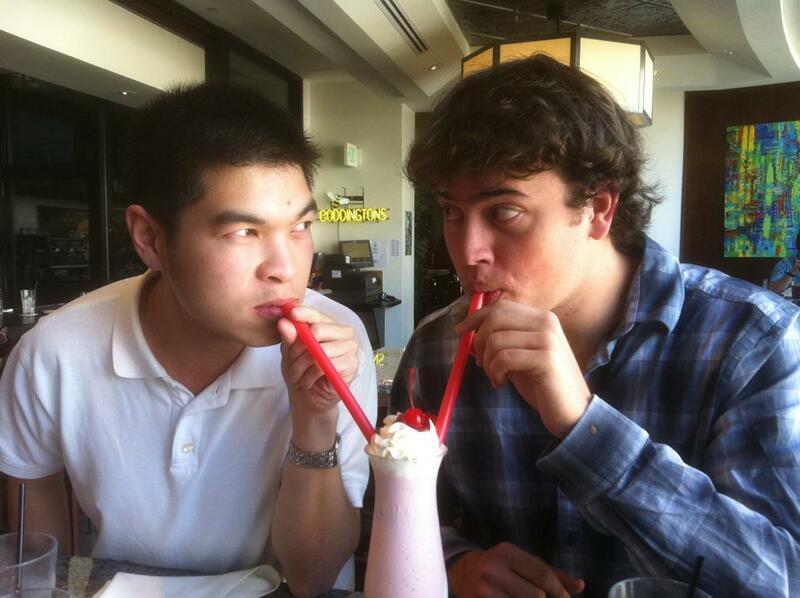 First they traveled across western China, then they shared this milkshake, (update: then took on Laos and Manila [with yours truly]). Who knows what’s next for them? So to put it in perspective, my meal cost approximately $25 after tax and tip. It’s a lot like going to Father’s Office in LA. Is the food delicious? Yes. Is it worth the money? More or less. Am I going back anytime soon? Probably not. I’m just not looking to spend $25 on a burger meal. 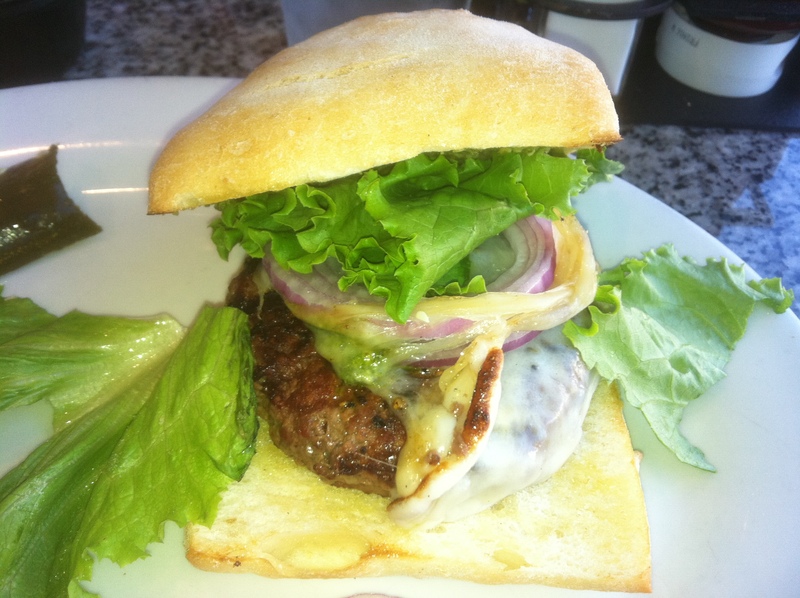 But that said, I completely recommend getting the Burger Bar experience – it’s a delicious one. P.S. If anybody reading this ever does order the $60 Rossini burger (yes, you read that right, go back to the menu again! ), I’d love to know what you think of possibly one of the most absurd dishes I have ever seen.